Women Veterans Health Program provides high quality medical health services to women Veterans which includes; Primary Care, Preventive Health Screenings including Breast and Cervical Cancer screens, Gender Specific Care, Reproductive Health Care including Maternity Care, Osteoporosis Evaluation and Treatment. 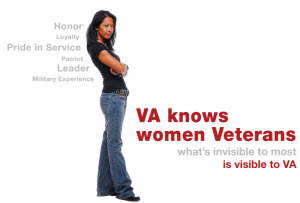 VA is also committed to assist women Veterans with a wide range of mental health and psychological services such as Sexual Trauma Counseling (MST), Substance Abuse Treatment, Evaluation and Treatment for PTSD, Programs for Homeless Veterans, Programs for victims of Domestic Violence and Vocational Rehabilitation Programs. CTVHCS offers Comprehensive Care (primary and gender specific care in one visit) to women Veterans at all locations including CBOC’s. We have a separate women’s health clinic at the Temple, Austin and Waco sites. GYN specialty care is also available at these locations. Digital Mammography is available at the Temple and Austin sites. If you live over 50 miles away from the Temple site, CTVHCS will pay for you to have a mammogram at a local facility near your place of residence. Did you know that women are the fastest growing group within the Veteran population? Learn more about the changing face of women Veterans and what the VA is doing to meet their health care needs. About one in five women and one in 100 men have told their VA provider that they experienced sexual assault or repeated, threatening sexual harassment while in the military? Because of the disproportionate ratio of men to women in the military, there are about comparable numbers of men and women that have experienced military sexual trauma (MST)? Treatment for all mental and physical health conditions related to MST is free? Veterans may be eligible for free MST-related care even if they are not eligible for other VA care?